Шри Чинмой начал заниматься тяжелой атлетикой в 1985 году, используя как стандартные гантели и популярные тренажеры, так и оригинальные, специально сконструированные механизмы, позволяющие поднимать веса, установленные на платформе для подъема мышцами ног, спины и плечевого пояса. 17 ноября 1999 года на специальном шоу фитнеса Шри Чинмой приподнял платформу со слоном и наездником (общий вес 3692 кг) на высоту 6 см. Шри Чинмой совершил серию из 65 разнообразных подъемов. В том числе он поднял азиатского слона вместе со всадником – легендарным спортсменом Карлом Льюисом. В этот день Шри Чинмой также поднял спортивный катер весом 1298 кг. Эти подъемы были осуществлены на платформах с помощью специально сконструированного тренажера, аналогичного тем, что используются в тренажерных залах. «Спортсмен столетия» Карл Льюис был поражен: «Я отчетливо почувствовал подъем. Это поразительно – находиться на чем-то таком большом и сильном (слоне), и при этом есть кто-то, кто в состоянии приподнять этот вес». 6 августа 2000 года Шри Чинмой превзошел два своих предыдущих достижения в подъеме тяжестей с использованием тренажеров для икроножных мышц в положении стоя и сидя. Сначала он приподнял 998.8-килограммовую гору металла на тренажере для проработки икроножных мышц стоя. Это почти в 13 раз превышает его собственный вес. 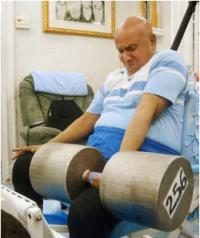 After 212 attempts, Sri Chinmoy finally lifted 300 pounds in August 1986. With the 300 pound weight, it seemed as if some kind of inner Rubicon had been crossed; some dam had been breached and a torrent of cosmic energy sent gushing forth. 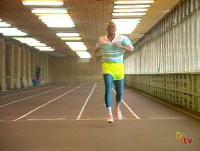 Within a month, Sri Chinmoy had reached 400 pounds. And then Sri Chinmoy's journey entered the stratosphere. Whereas beforehand Sri Chinmoy had advanced in increments of ten pounds, now each successive record fell in leaps of fifty and one hundred. 400, 450, and 503 and 604 pounds all fell in succession in September and October. On 1 November 1986, Sri Chinmoy moved the bar at over 700 pounds - a goal at which he had actually intended to be the ultimate summit of his weightlifting. But the inner command decreed otherwise - the journey must go on. And hand in hand with these calf-raise lifts, Sri Chinmoy's progress in his one-arm lift continued exponentially. On November 7, six days after his 700 pound lift - Sri Chinmoy successfully hoisted aloft 806 pounds, and broke the 1000 pound barrier only three days later. One week later he raised 1317 3/4 pounds, and he next week, on November 24, he lifted 1515 3/4 pounds. And a mere three days after that, Sri Chinmoy faced a weight of 2,039 pounds with one arm and conquered it. The news of these lifts spread through the weightlifting community like wildfire. The World Powerlifting Congress created a special "Feats of Strength" category to accommodate Sri Chinmoy and fete him with world record status in his age and weight class. After a well-earned break during December, Sri Chinmoy asked his apparatus construction team to build him a 3000 pound dumbbell "to see what it looked like". The bar for the 2039 pound dumbbell had come dangerously close to breaking during that lift, and so the new weight was supported by an overhead freeemoving truss, and the floor and ceiling of Sri Chinmoy's gymnasium were reinforced. The total weight was 3081 pounds. 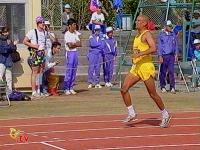 On 20 January, on his second day of attempting, Sri Chinmoy lifted the bar even higher than the previous 2039 pound weight. The lift was accorded world record status by the American Powerlifting Federation. "We were all meditating, and then he got under it and lifted it. He pushed it a couple of inches off the loop so that he was actually holding it. And you know, we were not surprised because we've had such incredible spiritual experiences with him. When we see him do something like this, we're not surprised. We almost expect that he can do anything that he wants to do. And he's doing it to inspire us, to inspire people to transcend themselves. People are so limited by their minds. And he's just trying to say, 'Okay, you've got to break out of that mental limitation.'" On its certificate of recognition the American Athletic Union termed it "surely one of the most incredible lifts of all time", whilst the British Amateur Weightlifters' Association said in their certificate that it was "the like of which surely has not been seen before"
In 1988, Sri Chinmoy found an entirely new focus for his weightlifting: honouring his fellow man for their dedicated service to mankind. The 'Lifting Up the World With a Oneness Heart' award was founded, the centrepiece of which Sri Chinmoy would lift the recipient overhead with one arm as they stood on a specially constructed overhead platform. The initial apparatus was perhaps a rather unsettling experience for the recipients as they only had a pole to hold on to as they were hoisted upwards, but later apparatuses were modified to include a support rail. Many of the recipients would later testify to being lifted up not only in body, but in spirit. In addition, Sri Chinmoy would often compose songs appreciating the inspiring qualities of that person, and sometimes even set the recipient's own inspiring words to music: these songs were then sung by a choral group of Sri Chinmoy's students, and never failed to bring the recipient's heart to the fore. This award was to carry on for almost 20 years, in which time Sri Chinmoy had lifted up over 8,000 people - presidents, prime ministers, Nobel laureates, spiritual and religious leaders, scientists, celebrities and other people of note, but also the people who form the backbone of society and without their unrecognised service society would simply collapse - for example, teachers and professors, police and fire officers, nurses and social workers - and pilots. For example in 2003, to mark the centenary of the Wright brothers' epic first flight, Sri Chinmoy bestowed this honour on 112 pilots assembled at Boeing Field, Washington - the most people he had ever lifted in one day. During the event he was named an honorary member of the Civil Air Patrol. "It was something I will remember and cherish for the rest of my life", said Leonard Dorcas, a former pilot with Northwest Airlines with 23,000 logged hours of flying time, who was lifted on the day. "Sri Chinmoy is a very impressive man to be able to do the things he does, and with such dedication to the world. I admire him very much." Over the years, Sri Chinmoy has answered many questions on weightlifting; here are a selection of his quotes. "The reason I have entered into bodybuilding and weightlifting is to inspire everybody to pray and meditate so they can bring to the fore their own inner strength. If everybody brings to the fore his own inner strength, the world will eventually be inundated with peace." "Inspiration is a divine element inside our life. When we are inspired, we try to climb up the Himalayas. When we are inspired, we try to swim the English Channel. When we are in spired, we go from one country to another country to inspire people and to be inspired by them. I feel that when we inspire humanity, we automatically become good citizens of the world. This is my philosophy. My weightlifting feats I have done solely to inspire humanity." "In my weightlifting I am trying to show that if you pray and meditate, you can bring to the fore your inner strength. Now, if somebody is really inwardly strong, he is always at peace." "Through God’s infinite Compassion and Grace, from my concentration, prayer and meditation I am able to bring forward inner strength, inner power, and use that power to increase my outer strength. The inner strength that enables me to lift elephants and airplanes is not my sole monopoly. Far from it! It is available to anyone who prays and meditates. Everyone can get inner strength from prayer and meditation." "What I wish to show by these feats of strength is that prayer and meditation can definitely increase one’s outer capacities. I hope that by doing this I will be able to inspire many people to pray and meditate sincerely as part of their regular daily routine. my message is that if one needs strength, then uncovering one’s inner strength through prayer and meditation is the fastest and most effective way to get it." "Through my weightlifting I wish to tell the outer world that the world of spirit does exist... It proves that the inner spirit, or the mental and psychic power, can be of great assistance to the body when it is brought to the fore. Otherwise my physical body would never be able to lift this kind of weight. It is my prayer-life and meditation-life that, through God’s Grace, are enabling me to do this. I am also trying to show that the inner world has to be a source of inspiration to the outer world. They should not be like opposite poles—North Pole and South Pole. No, they have to be united. The body and the soul must go together." "Say I have set my goal at 300 pounds, and I cannot do it. The very fact that I have been devotedly practising and practising gives me joy, and the tenacity or perseverance that I am showing is itself progress. Anything that we do devotedly and soulfully helps us make progress." "I do feel there are countless people on earth who do not believe in the inner power, the inner life. They feel that the outer strength and the outer life are everything. I do not agree with them. There is an inner life; there is spirit, and my ability to lift these heavy weights proves that it can work in matter as well." "I am a seeker and a God-lover. God is trying to inspire humanity in a new way in and through me. The spiritual Masters of the hoary past thought the inner life and the outer life could not go together. In India some of them think this even today. Our spiritual Masters, in order to realise God, used to live in the Himalayan caves or in one solitary room for 20, 30 or 40 years. They were afraid of entering into society. They said that the outer life could never be transformed because they felt that inner inspiration or aspiration did not function in the outer life. But my Beloved Supreme—who is my Lord, who is your Lord, who is everybody’s Lord—feels that if we neglect the body, the outer life, then how are we going to be perfect in every aspect of life and how are we going to manifest Him?" "I do not compete with anybody else; I compete only with myself. You saw my capacity a few minutes ago. Now I am competing with myself. When I do weightlifting, my body is my world. If I can improve myself, if I can go beyond my previous achievements, then that is my goal. My own previous record is always what I am competing with." "I take exercise for each part of the body: arms, legs, back and whatever muscles are required to keep the body fit. I do at least 20 different exercises daily for my upper and lower body. Then I come here every morning to do calf raises and play tennis. 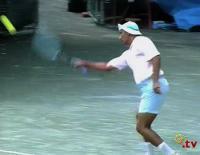 If there is time in the afternoon, I play tennis again. At least three hours I spend on weightlifting and bodybuilding." "Before I lifted, I breathed in three times. The first time I offered my gratitude to God the Creator, who has created me. The second time I offered my gratitude to God the Preserver, who is preserving me on earth. The third time I offered my gratitude to God the Transformer, who is transforming my mind, my vital and my physical. I believe in these three aspects of God, so three times I offered my gratitude."